5 weeks to Quebec City! AND we have a giveaway! The next stop on The ME Experience by Blogalicious tour is Quebec City, Canada. By now you’ve heard that we are partnering with Women in Travel Summit (WITS) to provide our very own track of programming to their lineup. We’re so excited about this!! The WITS conference is from May 4-6, 2018, and includes workshops, field trips, keynotes, and amazing giveaways. The ME Experience by Blogalicious program track is taking place on Sunday, May 6, 2018. The Women in Travel Summit is the premier event for women travel influencers and industry members, organized by Wanderful. Our goal is to provide our attendees with the tools, connections, and resources they need to become better travel bloggers and influencers and to equip great brands with partnerships that can help them enhance their digital presence and meet their business goals, all while growing our global sisterhood of dedicated women who travel. 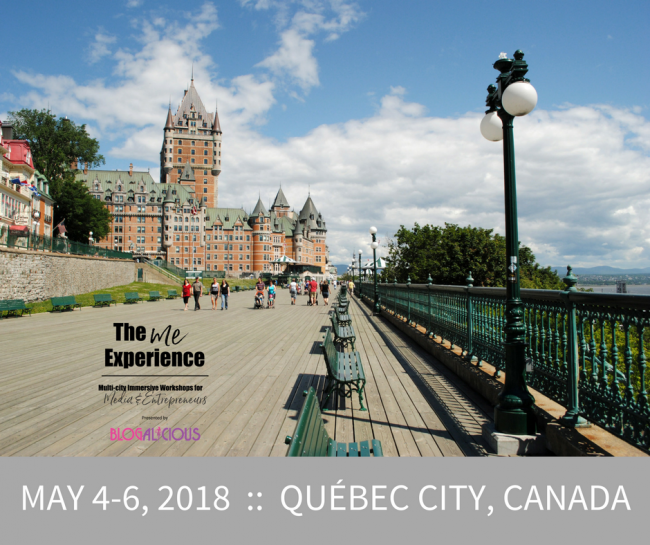 The ME Experience by Blogalicious :: Quebec City will feature three workshops and an off-site experience (details on all of that coming soooooon). Because we’re all about providing you with tools so that you can be intentional and strategic in your empire building, those attending our sessions will receive a The ME Experience by Blogalicious Workbook so that they can implement the information and strategies presented in their businesses right away. We’d love to see you there! There are only a handful of tickets left. Use code: 25blogalicious for 25% OFF. Registration for the Women In Travel Summit INCLUDES access to The ME Experience by Blogalicious program track. We want to bring a friend with us to Quebec City. Enter our giveaway and on Monday, April 9th we’ll announce the winner of one (1) full conference pass to the Women in Travel Summit! Note: The winner will be responsible for their own travel and lodging. To Enter: Make sure you’re following @beblogalicious and @witsummit on Twitter and Instagram. To increase your chances, leave a comment on this post telling us what destination is on your travel bucket list. Contest ends 11:59pm on Saturday, April 7th. Winner will be selected and announced on Monday, April 9th. Good luck! Or as they say in Quebec City: Bonne Chance! Thailand! I am dreaming on going there, hopefully this is the year! My bucket list destinations are Disney in Hawaii and Disney in China. This is so dope! My travel bucket list destination has got to be Salvador, Brazil. I would love to explore the Afro Brazillian cuisine. I really want to visit Morocco! The Amalfi Coast In Italy!!! omg, Id come all the way from Copenhagen! A place on my bucket list is Yukon. I have plans to travel there in the next year or two. The principality of Monaco is at the top of my bucket list. So excited to see this contest! I have so many places on my bucket list buy next would be Machu Picchu!! I’ve never been to Canada, so I’m excited to attend. I want to grow my food and travel blog and I feel this is the right conference to help me.